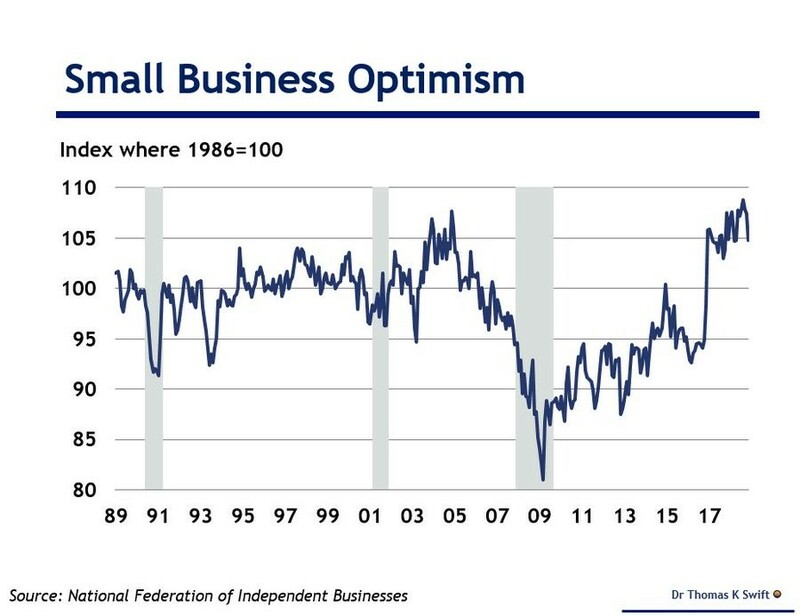 Volatility in the stock market combined with the political bias in the survey caused the NFIB small business optimism index to fall from 107.4 to 104.8. You can see this in the chart below. This report missed estimates for 107 and the low end of the consensus range which was 105.5. The stock market’s decline hurt this index, unlike consumer confidence which was strong. For the first time in 33 months and the 4th time in this expansion, none of the 10 components in the NFIB survey increased. The reading is still 4.5 points above the average from 1973 to 2007. But it’s weak in the rate of change terms. To be clear, the political weakness was catalyzed by the Democrats winning the House of Representatives in the November election. Let’s look at the individual components of the index. The best parts were the 2 unchanged components which were the expectation for credit conditions and plans to increase employment. Small businesses still need to hire workers but are challenged by the skill gap which is the difference between the qualifications workers need to complete a job and what they have. There was broad-based weakness in the rest of the categories. The one that stands out is the 11% decline in the expectations for the economy to improve. This is where stock market volatility and the Democrats winning the election affected the index. The NFIB stated that the index was basically unchanged after the election results were known. However, my counterpoint is everyone knew the Democrats would win a few days before the election. You might counter that people knew the Democrats would win the House for a few months. However, small business owners aren’t professional poll analysts. Anything can happen a few months before elections. As you can see from the chart below, the percentage of firms stating taxes are their biggest problem has increased recently. The recent bounce could be politically motivated. However, the bounce from the lowest level since 1982 early in the year suggests the tax bill didn’t live up to expectations for some small businesses.